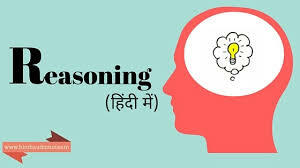 Reasoning Related Most Question With Answer Set 55 Current Affairs, Aptitude And Join the best Online Test Series & get all India Rank, Logical Reasoning. Logical Problems · Number Series · Verbal Reasoning and important Question & Answer with solution & Formulas in Hindi & English And Important Questions with Answers to Numerical Ability asked in Gramin Bank Office Assistant Exam And These all questions will very helpful to you for the forthcoming Bank exams, SSC CPO SI Delhi Police and Rajasthan Police and All Competitive Examination. ‘we so ze da’ को ‘be good save grace’ कोडित किया गया है. Question. (1) Which of the following codes is used for ‘must’? निम्नलिखित में से कौन सा कोड ‘must’ के लिए प्रयुक्त है? Question. (2) What does the code say ‘ze’? कोड ‘ze ‘ से क्या तात्पर्य है? Question. (3) Which of the following codes is used for ‘good’? निम्नलिखित में से कौन सा कोड ‘good’ के लिए प्रयुक्त है? Question. (5) If the cloud is called white, white is called rain, rain is called green, green is called air, air is called blue and blue is called water, so will the bird say fly? यदि cloud को white कहा जाता है, white को rain कहा जाता है, rain को green कहा जाता है, green को air कहा जाता है, air को blue कहा जाता है और blue को water कहा जाता है तो, बर्ड कहा फ्लाई करेंगी?